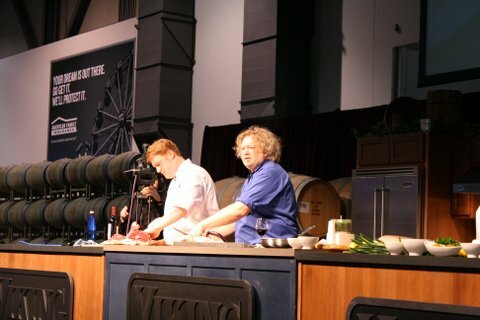 At Taste Washington, we took advantage of a couple of the seminars that were available. Not only could we sit and sip fabulous wines at eleven in the morning but the panelists are industry giants. Saturday I attended the Intro to the World of Wine seminar because Washington vs. the World was sold out. And amazingly after 27 years in the industry, I learned more about what makes Washington wines so special. Dr. Kevin Pogue, geology professor at Whitman College has written a few papers regarding the soils of eastern Washington from a different perspective. He thinks Washington has a unique place in the world of wine. And the terrior, which includes soil, has everything to do with that uniqueness. There are very few vineyards in the world planted on loess with basalt bedrock. Pronounced luss, and loosely translated means loose. This is silt-sized sediment, which is the accumulation of wind-blown dust left over from the Missoula Floods. Basalt is heavy and creates a warmer climate. This is what makes Washington wines so special. And so resistant to phylloxera, the dreaded root louse. Benches of basalt are now covered in vineyards. Great examples would be the Wallula Gap or Horse Heaven Hills. Thomas Price, Master Sommelier at The Metropolitan Grill and Linda Murphy, author of “American Wine, An Honest Drink” talked about the deductive process of tasting wine. “You have to build up the card catalogue in your memory,” Price said. And to each their own card catalogue. This was emphasized when they both described the flavors of the Kung Fu Girl Riesling 2012 hailing from Ancient Lakes AVA’s Evergreen Vineyards. It’s composed of calcium carbonate that adds limestone to the soil. That limestone element results in more mineral than fruit flavors in a wine. It’s also important to note that the lime flavors Price was describing, Murphy described as tangerine. Panelist Thomas Henick-Kling, Washington State University by way of Australia and Germany, explained how Syrah is the most expressive grape and the best at revealing the vineyard terrior. As a result, the flavor range varies by terrior. Black fruits, smoky, bacon fat, violets, licorice, earth and black pepper are some of the typical flavor profiles found in a Syrah depending on the soil and whether it’s a hot or cool vineyard. The Proper Wines 2010 Syrah had the black fruits and smoky bacon flavors of the warmer Walla Walla region. Novelty Hill Stillwater Creek 2011 Chardonnay is from a higher elevation in the Frenchman Hills and a cooler site. Obelisco 2009 Merlot was sourced from Red Mountain AVA where the Missoula Flood cobblestone gravels produce wines with elevated tannins. Red Mountain is a small AVA with 15 different soil types. Chateau Ste Michelle Canoe Ridge 2009 Cabernet Sauvignon was luscious with black fruits, black olive, baking spices and clove and vanilla from the oak barrels. Canoe Ridge produces succulent texture to Cabernets accessible when young, planted in 1992 200 yards from the Columbia River. With 30 to 40 mph winds there, the vines don’t get very big. Syncline Columbia Valley 2011 Subduction Red is a blend with a base of Grenache. Grenache in cooler vintages is all white pepper nose and raspberry with a brilliant purple rim. The final round was an interesting question about what varietal the panelists would like to see more of in Washington State. Murphy had consulted in Washington in the early years when Hogue had four Chenin Blancs available. Now this grape is hard to find. Price thought the Picpoul grape has a place in the dry warm regions of the state. McCrea vineyards Picpoul was mentioned. Henick-Kling, having spent time in Australia, would like to see more Sauvignon Blanc and Sémillon planted here. Curious, isn’t it? With total wine production in 2012 at 12 million cases, the ratio of reds to whites is 50.3 percent to 49.7 percent. They all mentioned white grapes. Maybe to even things up? How is it time for Taste Washington again, you might ask? Good question — we’re asking ourselves the same thing. It seems like only yesterday I was 8 months pregnant, waddling around the CenturyLink Event Center with Mary and Jeff taking tiny sips (and spitting) some great wines. Thank goodness this year I’m free and clear to do as much wine tasting as my palate will allow (the baby is being dropped off at Grandma’s so mom and dad can get some good wine tasting quality time). Before attending these large-scale tastings we always create a game plan — review the list of wineries and what they expect to pour, and then decide who we just can’t miss. Last year Jeff’s plan was to taste all of the most expensive wines being poured. That was a lot of fun. While we create a plan, we almost never stick to it — winery ADD takes over when we get into the building. Nevertheless, we still like to pretend we have a plan. Doubleback: Only time I’ll get to taste the most expensive wine at this event. Desert Wind: Love their wines and want to see what they’re up too. Two Mountain: Really love the wines, the guys who run it and just tasted a homemade port made from Two Mountain grapes. Buty Winery: Love their wine and they are sooo affordable. Powers Winery: Here’s a winery that has been around forever and still produces quality, affordable wines. Smasne: Tough to find in Kitsap so here’s my chance to see what they’ve been up to. Rotie: Have to try these as they produced our favorite wine last year. Canoe Ridge Vineyard: After recently drinking a cab from this winery I’d like to see what else they have. Cave B: At our first Taste WA experience I tried their chardonnay and fell in love, it’s time to rekindle that romance. Efeste: I see their label everywhere but have never given then a try, now’s my chance. Maison Bleue Winery: Tried the wines a couple years ago at the Rhone Rangers tasting in Seattle, loved everything he poured. Rotie: Tops my list because I have a few bottles of their Northern Red(which was my all-time favorite wine tasted at last year’s Taste Washington). Woodward Canyon: Last on the Taste WA list, but certainly at the top of my list, especially because one of the winery owners has Bremerton roots. It’s March, do you know what that means? Beyond our days staying light a little longer and the daffodils starting to push through the soggy ground, it also means that it’s Washington Wine Month. And what happens during Washington Wine Month? Taste Washington, of course! This year the event is scheduled for Saturday and Sunday, March 23-24. It will be at the CenturyLink Field Event Center — walking distance from the Colman ferry dock. If you choose to go for two days, the ticket price for general admission is $125, or $80 for one day. Hours are 2 to 5 p.m. Saturday and Sunday. Last year we loved that they expanded the event to two days. It gives you a chance to taste more wineries without overloading your tastebuds. If you want to go all out, there’s a VIP package which includes an extra hour — 1 to 5 p.m. admission — and access to the barrel room, a VIP lounge; a “swag bag” and special giveaways during the VIP hour. There’s also the chance to attend seminars on Saturday and Sunday, where you can learn about Washington’s wine industry from some of the state’s leaders. Seminars are 11 a.m. to 12:30 p.m. each day, and require an additional admission, which varies depending on topic. Visit the seminar page here for more information. To buy tickets, or to see a complete list of wineries planning to pour at Taste Washington, visit the event website. Well it took us long enough, but almost a month after attending the state’s largest wine tasting event we have finally transferred our thoughts from scribbles on pieces of paper to a coherent blog post. (Well at least we hope it’s coherent). Going into Taste Washington we had quite the ambitious list of wineries we wanted to visit while attending the four-hour event at the CenturyLink event center. Unlike last year, this year’s event was held over two days. We didn’t find out though until we received our press credentials the week of the event that we could attend both days. Unfortunately I had already scheduled myself for something Saturday afternoon, but Mary took advantage of the access and went Saturday and Sunday. You better believe if they hold it over two days next year (which we’ve heard rumors they will) that I’ll be right there beside Mary maximizing my sips Saturday and Sunday. Like last year we made sure to pace ourselves as we cruised through the aisles, stopping to nibble some of the delicious bites prepared by area restaurants. We also carried bottles of water with us to stay hydrated. And while we had a list of where we planned to go, like any good wine taster with ADD, we often found ourselves sidetracked by a winery that caught our eye — sending us in crisscrossing through the event center. The good thing is we still had a blast, even if we didn’t hit every winery on our list. One thing we did make sure to do was visit as many of the tables that we could that were pouring the most expensive wines of the day. Seeing as I was eight months pregnant at the time of the event, my husband Jeff went as my designated taster. Before the event he read through the list and marked some of the most expensive bottles, figuring it might be the only time we’d get the chance to taste that many high quality wines at one time. I was in charge of photography, but I did taste at almost every stop, followed by a lot of spitting. The reviews though are largely from Mary’s and Jeff’s comments and my summations of their responses to what we tried. Since my palate was still off from pregnancy, and because I was taking micro sips, I let them take the lead. We’ll start with the most expensive wine we tasted. It was the 2007 Reserve Cabernet Sauvignon from Boudreaux Cellars out of Leavenworth and it was $100. The cab comes from Champoux Vineyards (75 percent) and Loess Vineyard (25 percent) in Walla Walla. An interesting side note about this winery: it’s completely off the power grid, meaning winemaker Rob Newsom relies heavily on nature to get things done. My palate isn’t fine tuned enough to know whether I’m drinking a $100 bottle of wine or a $50 bottle of wine, but between this and the Bordeaux blend the winery was pouring the reserve was our favorite. Speaking of favorites, the absolute favorite wine of the day for Brynn and Jeff came from Rotie Cellars. It was the winery’s Northern Blend, made up of 95 percent syrah and 5 percent viognier. The deep purple color exemplified what we’d expect from Rhone-style syrah and its meaty nose had a beautiful aroma. The midpalate was complex with a lot of flavors. This wine was reminiscent of France’s Rhone Valley syrah — something winemaker Sean Boyd was aiming to replicate. The finish is long lasting, leaving you time to think about how much you want a second sip. Another favorite from Rotie was the winery’s Southern White, composed of 50 percent viognier, 30 percent roussane and 20 percent marsanne. It is a perfectly balanced, full-bodied wine with peachy fruit flavors and stony minerals. V.G. Robert Ramsey Cellars, 2009 McKinley Springs Mourvedre. We tried this at the Kitsap Wine Festival and really liked it then — tasting it a second time confirmed our first impression: it’s a great wine. It’s rare to see this grape without its partners in wine, Syrah and Grenache but that didn’t stop us. The color was dark purple red and stained the glass. Lots of complexity with leather, dark fruits and a pleasant earthiness. Doubleback 2009 Cabernet Sauvignon This Walla Walla cab was one of the most expensive and therefore a must try. At $89 it was probably the second most expensive wine we had all day. This wine reminded Brynn of a Napa Cab, with its in your face flavors. Winemaker Chris Figgins has created a complex wine that we wish we could have tried as it opened up over time — as recommended by winery owner Drew Bledsoe in his tasting notes. It was a little too up front for Brynn, but would be one we’d try again after letting it breathe for a couple hours. Figgins Estate Red Bordeaux this 2008 estate blend came in at $85. It’s a mix of cab, merlot and petit verdot. The cab is heavy upfront, yet the nose hints at its merlot subtleties. It’s a wine that could be drunk now, or laid down for a little more time to age. Brian Carter Cellars always has interesting blends. His Corrida is a Spanish style blend of Tempranillo, Merlot, Garnacha and Cab. An unusual blend with the Cab and Merlot in there, but these grapes added a little more body and flavor to the Tempranillo. Castillo de Feliciana’s Columbia Valley Micalato, another Spanish style from Red Mountain grapes is a blend of 68 percent Garnacha, 13 percent Tempranillo, 10 percent Syrah and 9 percent Counoise. Wine had ripe red fruit and herbal flavors and a really nice and round, smooth finish. Right next-door was bin on the lake with Pork belly tart tatin coins. Darn! Those were tasty! Cave B’s Barbera was nice but what truly impressed us was the 2010 unoaked Columbia Valley Chardonnay. If you want to taste Chardonnay, no oak ageing, no barrel fermentation, no sur lies, this is it pure unadulterated Chardonnay. Cascade Cliffs’ Barbera was awesome. Bob Lorkowski planted Piedmont grapes along the Columbia River in 1997. Mary likes to think she set him off on the Piedmont path when she tasted him on what she thought was the best Barbera on the planet at her Grape Expectations wine shop. Cigluitti Barbera d’Alba. He also has a very good Zinfandel. Chandler Reach Vineyards from Benton City has a rich, smooth Cab called Parris. The wine was aged in American, French and Hungarian oak before blending and bottling. The complexity comes from the different blends of oak rather than the grapes. Another impressive wine. Januik Winery 2009 Ciel du Cheval Petite Verdot is a rich with black fruits with hints of minerals, great balance and a weighty mouthfeel. The finish is smooth but will improve with some cellaring. Kana Cellars 2008 Dark Star is a luscious blend of mostly Syrah, Mourvedre and Grenache that is barrel aged for 3 years. V.G. Long Shadows Vintners 2007 Columbia Valley Pedestal Merlot is a concentrated dark cherry, toasty oak-kissed wine made by Michel Rolland from Pomerol. Marcus Sophia Winery is located in Graham. Winemaker Laela Cramer sources her grapes from Alder Ridge and Horse Heaven Hills, two very well known vineyards. Her 2009 Yakima Valley Merlot is a blend of 85 percent syrah and 15 percent cab franc aged in American oak. Well worth seeking out. She also makes a syrah in the traditional way, cold soaking to extract flavor and color and then co-fermenting with a bit of viognier. It’s earthier then most syrahs but impressive. Michael Florentino 2008 Columbia Valley Monastrell. It’s rare to see this grape without its partners in wine, syrah and grenache. monastrell is the Spanish way for saying mourvèdre. It’s thick-skinned grape is the reason these wines are so inky purple and tannic. This monastrell has lots of black fruit flavors with spice, leather, and herbal nuances. A really good lamb sausage from the Hook & Plow restaurant was perfect with this wine. Pondera Winery out of Woodinville 2008 Columbia Valley Consensio is a Bordeaux blend of 58 percent cab, 27 percent merlot, 10 percent cab franc and 5 percent malbec. This full-bodied wine is richly colored with flavors of cherries plums and hints of spice and mocha. The finish is long and smooth. Saviah Cellars 2008 Walla Walla Petit Verdot is a rich, glass-staining-black red wine with black fruits with hints of leather and minerals, balanced, smooth and velvety. What a mouthful! Sparkman Cellars 2009 Red Mountain Kingpin Cab. There’s a mouthful of wine. Rich with black currant and plum, tobacco, leather and spice. Smooth, rich with a long, long finish. Nicely paired with Assagio Ristorante’s Penne with wild boar ragu. Yum! Syncline James and Poppy Mantone’s 2009 Blanc de Blanc has a fine bead and citrus flavors that paired very nicely with the chicken liver pate from RN74. Treveri Cellars Sparkling Mueller-Thurgau. This grape is a cross of riesling and silvaner grapes. The citrus and mineral flavors balanced by 3 percent residual sugar paired very nicely with the shrimp seviche with dry cured chorizo and cucumbers from the Purple Café and Wine Bar. Waters Winery out Walla Walla way has a fabulous 2008 Columbia Valley Cabernet. With dark fruits, leather and spice, it has depth and complexity. Sourced from Cold Creek and Pepper Bridge Vineyards. Taste Washington is upon us and is always the case with these large-scale tastings, it’s best to arrive prepared. 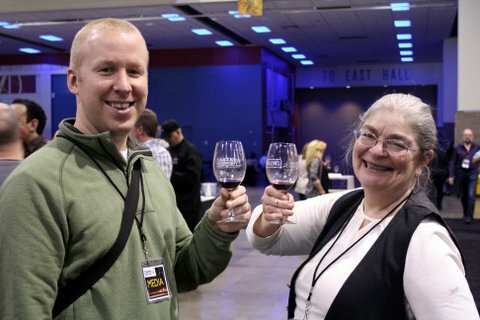 Clearly with more than 200 wineries pouring multiple wines this weekend at the CenturyLink event center there is no way anyone will be able to taste everything. Heck, even if you attend both days of the event, you probably wouldn’t even get close to visiting half of the wineries. And that’s OK. Before heading into an event like Taste Washington it’s best to be prepared. If you’re not, you can easily find yourself overwhelmed, and while you’ll probably still have a great time you could miss out on some great wines. That’s why we pour over the list of attendees to whittle down our “must taste list” before heading into the event. Our lists may be overly ambitious, but it’s also good to have some fall back wineries you want to visit, in case the tables are packed and you can’t get to your preferred destination right away. Beyond attending these events with lists in hand, we also make sure we’re properly hydrated and ready to spit whenever we can to keep our taste buds from hitting the wall too early. Not to mention we want to be able to walk out of there on a relatively straight line.